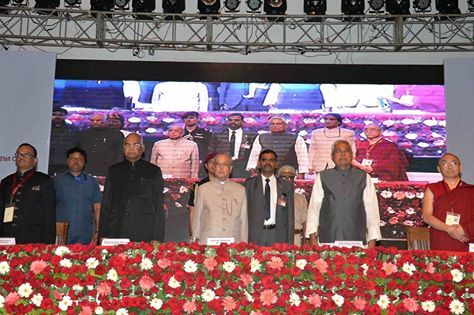 New Delhi: The President of India, Shri Pranab Mukherjee addressed the closing ceremony of an International Conference on “Buddhism in the 21st Century – perspectives and responses to Global Challenges and Crises” at Rajgir, Nalanda, Bihar today (March 19, 2017). Speaking on the occasion, the President said that no part of the world today is free from the scourge of violence. This crisis is all pervasive. The basic question being raised today is how to stop this wanton destruction and come back to sanity. He said that the philosophy of Buddhism is as relevant today as ever – especially as the world grapples with complex problems that seem intractable. Buddhism has had a deep influence on human civilization. The mighty emperor Ashoka who had the ambition of extending his empire as far as he could was converted into a missionary. Dhamma Ashoka is remembered in history rather than warrior Ashoka. Addressing the delegates present there, the President said as they return to their respective areas of activity and influence, he requested them all to redouble their efforts to promote the simple Truths and the Path of the Buddha that show we can be better citizens and contribute to making our land a better place to live in. The President expressed happiness that the Nava Nalanda Mahavihara has published the entire Pali Tripitaka (texts or words of the Buddha) in 41 volumes in the Devanagari script. He congratulated the Nava Nalanda Mahavihara University for this grand achievement and for opening the first ever Department of Buddhist Sciences in the world. He said that he would encourage the texts to be further dispersed – like seeds by migrating birds – far beyond the institutions of Buddhist studies and our region – to Universities in all parts of the world – regardless of their academic specialization. He stated that these initiatives will go a long way in popularizing the tenets of Buddhism. They will help the coming generations to easily connect with the supreme ideals of humanity, forbearance, discipline and compassion. Once these values are adopted by more and more scientists, engineers, entrepreneurs and leaders in letter and spirit, he had no doubt that they will work to gear up to address the skepticism and cynicism that ails modern societies.